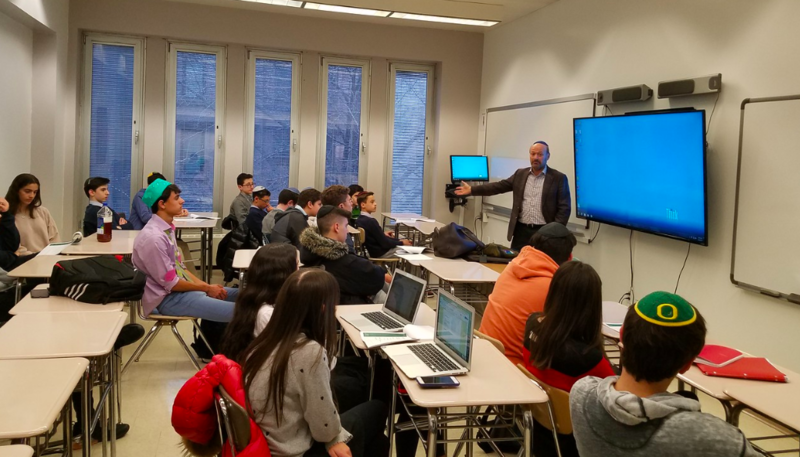 By Lucy D. and Gail T.
This week, BIC heard from Mr. Berndt Perl, a Ramaz parent who was raised in Germany and later went on to Duke and Harvard Business School. He, along with a partner, Kenneth Aschendorf, started APF Properties Company which focuses mainly on buying real estate such as office buildings with retail stores. He explained how real estate is a broad industry with many different aspects to it, and that you do not need much experience to be in the business. He told students that often people who are more educated over analyze and are not as good for the job because in many cases it is better to follow your gut. He himself got into real estate as a side job. He invested with friends and when the real estate became more important he shifted to focus on it as his main job. Mr. Perl gave a case study of one of his properties, and talked about how they get investors. One aspect that makes his company stand out is the fact that they only invest in LEED certified buildings, meaning they must be environmentally responsible. Lastly he explained how his company is adapting to new competition such as WeWork by incorporating gyms or day care centers depending on the neighborhood and types of companies the building may attract.